Grand Master Hummingbird Feeder. 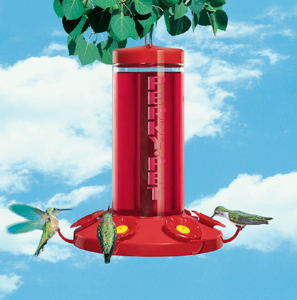 'Wide-Mouth' Design Hummingbird Feeder. State of the Art, No-Drip Hummingbird Feeder. Features a 'Wide-Mouth' feeder bottle designed for easy cleaning and filling. The unique, NO-DRIP feeder base provides six removable feeding flowers and perches. The Grand Master feeder is made of rugged acrylic for years of enjoyment.